That Jamie Oliver, he sure has a way with leeks. 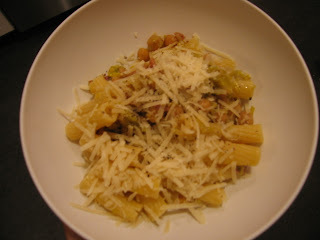 My Leek and Chick Pea Soup (that is pretty much everyone's favorite on this blog) was adapted from his recipe and now I had another adaption of one of his - Slow-cooked Leek and Proscuitto Pasta. This is so crazy good I lick my plate when we have it. I suggest making a huge batch of the slow-cooked leeks and keeping them on hand (they'll keep in the fridge for a week or two and would probably freeze fine, but I never have them around long enough to test that) for pasta or for an even faster version of the soup. This is a very monochromatic dish so I've been holding off posting it in hopes of having a good picture. Oh well, it's too good to keep secret any longer. Prep the leeks by cutting off the root end and the green top (I use the green up until it gets stiff, but leek purists don't use any green). Slice them lengthwise and then into thin half-moons. Leeks can have dirt in between their tight layers so I rinse mine well and then dry them in a salad spinner. In a wide, deep frying pan, melt the butter and heat the oil (the bit of oil keeps the butter from browning). Add the leeks and garlic and saute for about 10 minutes or until you are just starting to see browning. Add the wine and stock and then lay the slices of prosciutto over the top (see the photo above). 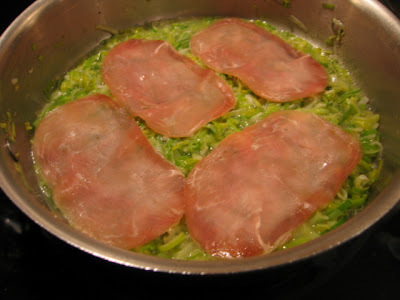 You can substitute salami or ham, you'll just need enough to cover the leeks. Reduce to a simmer for 30 to 40 minutes. Do a couple checks to make sure the leeks aren't sticking, but don't stir in the prosciutto. If it seems like the pan is drying out you can put a lid half on and/or add a little water. Prepare your pasta while the leeks are simmering. Remove the prosciutto and slice it into thin pieces. Stir this into the leeks. Toss the leeks with the cooked pasta, top with Parm. and you're done. i'm definitely trying this! sounds soooo good!